One of the many, many amazing things about ice cream is how versatile it is. From horseradish to wasabi hot pea, there’s an icy flavour to tickle even the most particular of taste buds. Swiss chocolate giant Toblerone has gained something of a cult following over the years, despite its intimidatingly sharp shape. Nowadays, it’s easier than ever to live the Toblerone life – you can buy colossal one metre Toblerones for around a squillion quid and can even enjoy alternate flavours such as SnowTop and Crispy Coconut. Now you can even grab a Toblerone ice cream from your local supermarket freezer; as chilly and as thrilling as a bracing walk in the Swiss Alps. Random thought: does toblerone make ice cream and I’m just not hip..? ? I mean, just try and imagine this treat confined to your regulation oval or rectangle shape. Impossible. We already know this signature combination to be a winning recipe, but just imagine how refreshing this would be in your back garden when the sun starts to peek out. It's not just the shape then, its actual Toblerone ice cream!!! ? 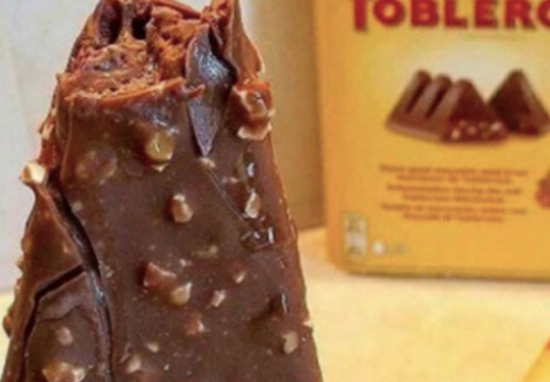 Try Toblerone ice cream sticks. Heaven. Honey fiends are naturally swooning at this oh-so-sweet news, giving into triangle temptation. So unfold your deck chair, slip on your flip flops and let the fresh mountain air sweep across your tongue.